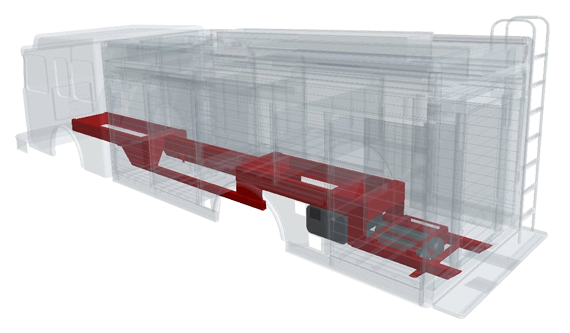 The Pinch Frame Design is a custom engineered design that provides up to 30% additional capacity without extending the wheelbase or raising the body. 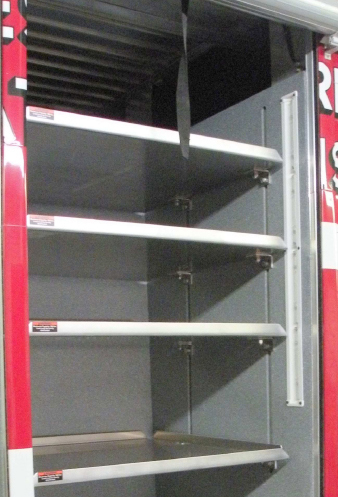 This Hackney specific design provides maximized storage capacity with compartment depths of 40 to 42" compared to the standard fire apparatus design of 24". The Pinched frame design allows for a lower floor to ground height, which increases the overall height of the compartments and allows heavier items to be much easier loaded and unloaded. The Hackney roll up door design permits the doors to roll up and over the top of the compartment instead of a roll at the top of the compartment. 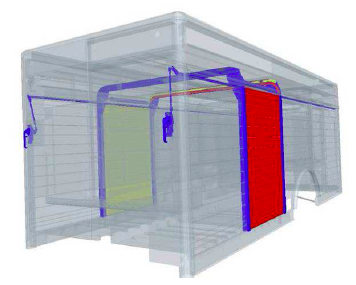 This design allows prevents rain, snow and debris on exterior from entering compartments when doors are opened. The Hackney Body and Compartment design utilize an integrated door track to provide a true compartment opening. Typical compartments on a fire apparatus loose 5" to 7" due to the door tracks, but with the Hackney design a 40" compartment has a 40" opening. The LED compartment lights and shelving tracking is recessed in the side of the compartment. This design maximizes the available width for storage shelves and provides a clean opening for loading/unloading items.